We Cajuns, as do New Englanders, use salt pork to season many dishes. I learned to call it "Salt Meat" when I was a kid in Houma, LA. 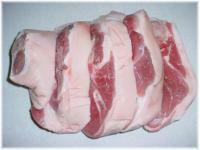 Actually salt pork is taken from the belly of the pig; salt meat is a salt cured pork leg, the front leg or "picnic". We can buy this in single packs or as a leg as shown here. Cajuns use salt meat to cook beans and other vegetables. It's a staple to us similar to ham hocks. Shown to the right is a pork leg that has been salt cured and sliced. Is salt meat the same as pickled pork? Yes it is! We'll cut it up in portion sizes that fit our cooking needs then freeze it as shown to the left. Salt curing is the original method used to preserve meats before refrigeration was available. Today salt curing is still used to enhance the shelf life of foods such as bacon, smoked sausage, hot dogs and bologna to name a few. Sodium nitrite (a cousin of sodium nitrate) is used to do the curing. Table salt is sodium chloride for you science buffs. Here are a few Cajun recipes that use salt meat. Today's salt meat doesn't have near the salt on it as it had years ago. This is why it must be refrigerated.